It’s 7pm and sundown on a hot fall evening in October. Hundreds of people wait in line to enter the High Line for the premiere of The Mile-Long Opera, a collaborative performance ten years in the making that animates the High Line October 3 through 8. 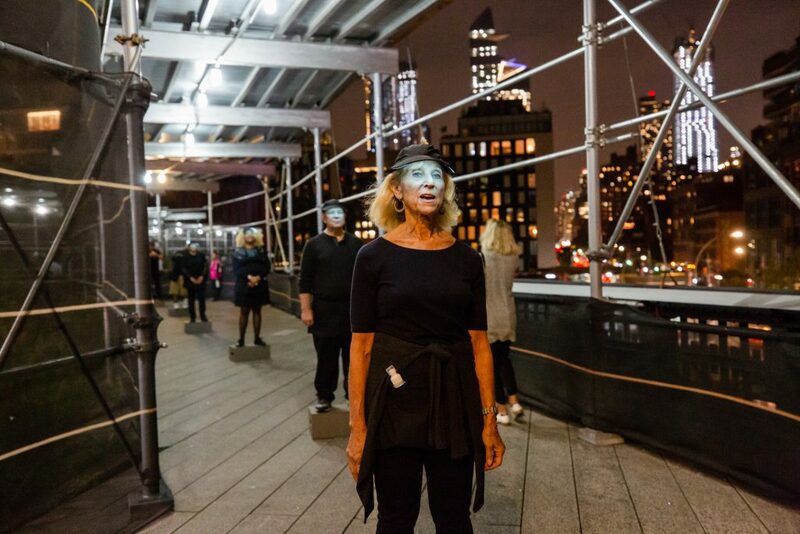 Conceived by architects Diller Scofidio + Renfro and Pulitzer Prize-winning composer David Lang, The Mile-Long Opera: a biography of 7 o’clock brings together 1,000 singers atop the High Line in an ambitious, immersive, free choral performance. Poet Anne Carson wrote the libretto and poet Claudia Rankine wrote the spoken text. Elizabeth Diller and Lynsey Peisinger directed the performance, and Director Donald Nally conducted the multifaceted chorus. The piece was co-produced by Diller Scofidio + Renfro, the High Line and THE OFFICE performing arts + film. At the top of the steps, a greeter in a pink vest whispers that attendees aren’t to speak. Another tells us to turn off our phones, and another tells us to walk slowly, but to keep moving along the path, pushed along at a pace unheard of in New York City. Once on the High Line, we’re met with a spattering of performers dressed in black standing on apple boxes. Their faces are illuminated by glowing baseball hat rims or Styrofoam coffee cups. They sing and speak with a mechanical affect diffused with a bit of casual personality, at times responsive to passersby, at other times disconnected. Some singers are more animated; if you make eye-contact, they’ll hold your gaze while reciting their words, and break it only when you choose to look away. The path meanders around the singers for the entire length of the High Line. A few words are caught here and there—lyrics started by one performer are overlapped, sometimes finished, by another down the line. This collective effort to perform a single thought evokes the entire ethos of The Mile-Long Opera: a deceptively simple result from years of complex, collaborative planning and community engagement. What does 7pm mean to you? The original idea for the opera came when Liz Diller, partner at Diller Scofidio + Renfro, first began design work on the High Line in 2004. She saw the space as a public performance stage and conceptualized a project that would incorporate the inherent theatricality of the park and its surroundings. Flash forward to 2017 when this dream began to take shape. Peoplmovr and the High Line introduced The Mile-Long Opera creative team to a number of neighbors and community stakeholders in a series of meetings. Together with seven nonprofit partners, Abrons Arts Center, Greater Harlem Chamber of Commerce in Manhattan, ARTs East NY in Brooklyn, Flushing Town Hall in Queens, Jacob A. Riis Settlement in Queens, The Point CDC in the Bronx, and Snug Harbor in Staten Island, The Mile-Long Opera and the High Line recruited singers, held open rehearsals and workshops, and hosted social and cultural events in the lead-up to the October performances. 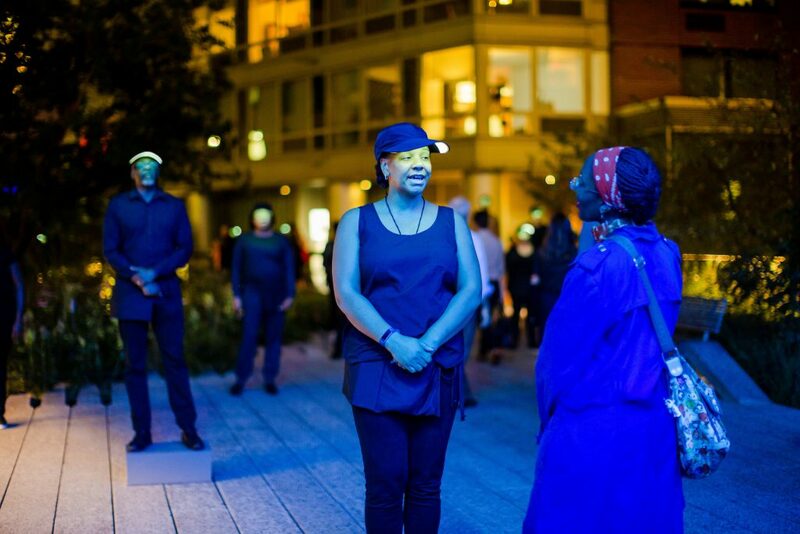 As a co-producer of The Mile-Long Opera, and in working with these nonprofit organizations and choirs across all five boroughs, the High Line furthered its vision to reach beyond the park, collaborate across New York City, and engage audiences in their own communities. The core result of these efforts are the hundreds of multi-cultural stories and images gathered from across New York City—LES, Chinatown, East Harlem, Queens, Long Island City, and Far Rockaway. The question asked? “What does 7pm mean to you?” Historically this time meant a home going, an end to the work day, a settling in. But not so much anymore in our contemporary lives. As the libretto reiterates: things are changing, and fast. Sometimes this change affects nothing, sometimes everything. From the stories gathered for The Mile-Long Opera, 7pm means stuck on a subway, wet cement after rain, lamenting the loss of friends, going to work, going out, tears, manicures. It means dollar pancakes or polenta or a good glass of red wine. After these stories were collected, Anne Carson then reviewed the transcripts of the interviews while writing the libretto and Claudia Rankine “reached out to a random array of people who described their dining tables.” Her prose pieces are influenced by this as well as her own reflections on 7pm. The scale of The Mile-Long Opera—both its physicality of production and its community outreach—reflect the High Line’s evolving perspective on public programming. Yet, this scope contrasts with the intimacy of the relationships that comprise the on-the-ground nature of the production. The institutional partnerships and the indispensable participation of the 1,000 singers from the 38 choirs (who literally and figuratively lit up the High Line’s outdoor stage) actualize the conceptual fabric of this project. Despite the noise of the city and the groups of people moving past, singers and audience members share private moments of connections—though the choir members sing for thousands of people each night, they perform like they are telling a story for just one person. The connection between people and the city is embodied by the relationship between the singers and the backdrop of the skyline. The new and old buildings in the surrounding neighborhood work in concert with two main themes of the opera—change and city life—and the High Line becomes a theater. Singers are positioned below and to the side of visitors. Performers stationed in a handful of adjacent buildings paint and erase white marks or perform Sisyphean window washing. This encourages visitors to look up and down, to engage with their surroundings—actions that are disappearing as we adapt to walking with devices in our hands that divert our attention. The slow pace without pause, without phones, without speaking insists on presentness. It’s a new, arresting way to experience the park and the city. At one moment I noticed a broken, flashing construction light and a man shouting obscenities from the street. I overheard a visitor say “the performance brought a certain mindfulness of the senses.” Someone stopped me to watch a woman in an apartment across the path struggling with her curtains. It seemed as though everything around me was part of the performance. The action of, like the making of, The Mile Long Opera isn’t linear or self-contained. 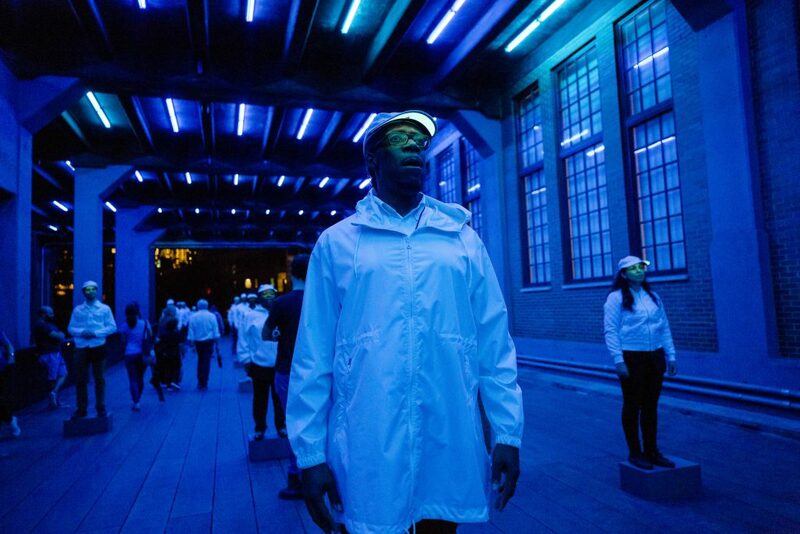 To further the High Line’s intent of taking art outdoors in order to reach new audiences, The Mile-Long Opera’s Presenting Sponsor, Target has created an immersive 360° experience to be enjoyed by those unable to attend, and to extend the performances far past closing night. Each night, Target will capture video from the performance and upload segments that can be watched by anyone, anywhere. Whatever can happen to anyone can happen to us, whatever can happen to a city can happen to this city. People’s interactions in public spaces everywhere are the threads that make up the fabric of cities. Those of us who share space are connected in small ways, particularly the repetition of our days and movements. The Mile-Long Opera reminds us that no matter where we are situated at a particular hour of the day, there is harmonious simultaneity occurring just a mile down the road. Target is the Presenting Sponsor of The Mile-Long Opera: a biography of 7 o’clock. The Presenting Sponsor, Target, has created an interactive 360° experience so that you can take part in The Mile-Long Opera performances from your own digital device.